I have recently discovered a new favorite show on the Food Network: Heartland Table. There have only been a handful of episodes thus far (maybe 6 or 7 total) but every time I see an episode, I want to make EVERYTHING, immediately. I basically watch the episode, drool a lot, and then run to the Food Network website to pin every single recipe. Makes for a nice little Saturday morning. This is the first recipe I ever made from that show, and I’ve made it a couple times since. It requires a bit of time standing over the stove, but it’s pretty simple… and the smell of that thyme- and garlic-rubbed pork roasting is so intoxicatingly fantastic, you’ll dream about it at night. 1.) Remove the pork from the fridge about half an hour before you’re going to cook it, to let it warm up a bit. Heat a large, oven-proof skillet over medium-high heat, and add a couple tablespoons of canola oil to the pan (while you’re at it, preheat your oven to 375°). 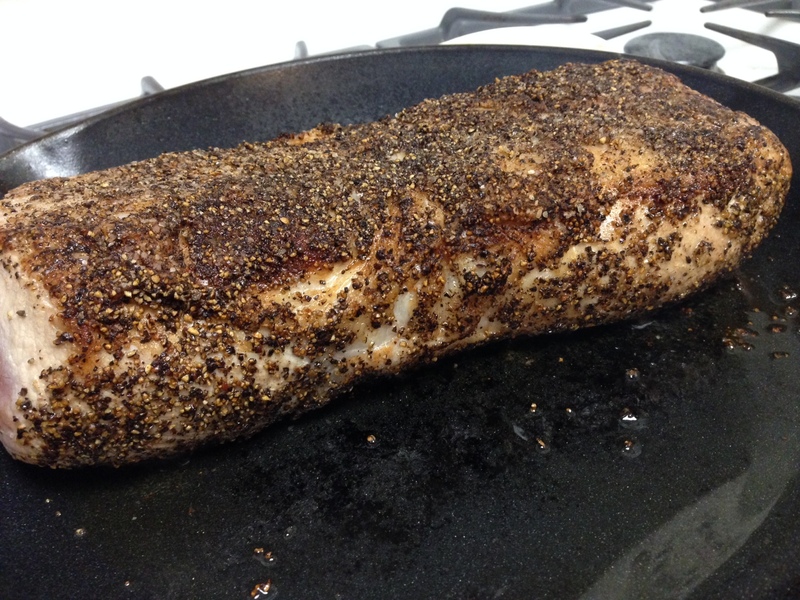 While the pan heats, pat the pork loin dry; sprinkle it with the teaspoon of kosher salt, then cover it in the black pepper, using your hands to firmly press it on to the pork to be sure it sticks. Reserve any unused pepper for the basting sauce. 2.) Once the pan is hot, sear the pork on all sides, including the ends. While the pork is searing, heat a small sauce pan over medium heat, and add the butter to it. Once the butter bubbles up, add the apple cider vinegar, garlic, chopped thyme, and remaining black pepper. Remove the mixture from the heat. 3.) When the pork has been seared and the basting sauce is ready, use a brush to baste the pork with the sauce, and then place the entire pan in the oven. Roast the pork for about 50 minutes, removing it from the oven every 10 minutes to flip it and baste it. Try not to pass out from the heavenly smell emanating from the oven. 4.) While the pork roasts, make your sandwich spread. Mix all the ingredients together in a small bowl; cover and refrigerate until you’re ready to use it. 5.) Remove the pork from the oven, and let it rest for about 15 minutes. If you’re planning to only use the pork cold, set it aside and allow it to cool for about an hour, then wrap it tightly in plastic wrap and refrigerate it until it’s thoroughly chilled. 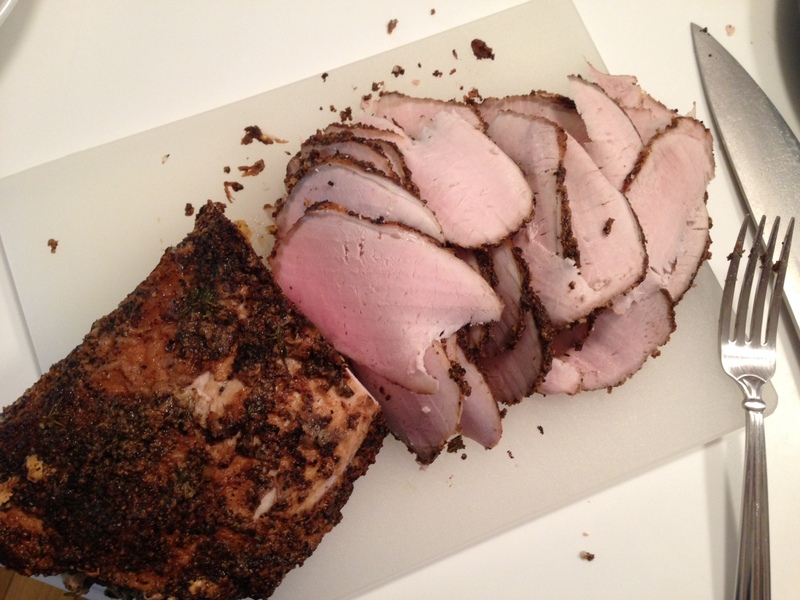 You’ll want to thinly slice the pork as you need it; keeping the loin whole will prevent the pork from drying out. 6.) To assemble the sandwiches: spread the warmed/toasted pitas with the mayo sauce. 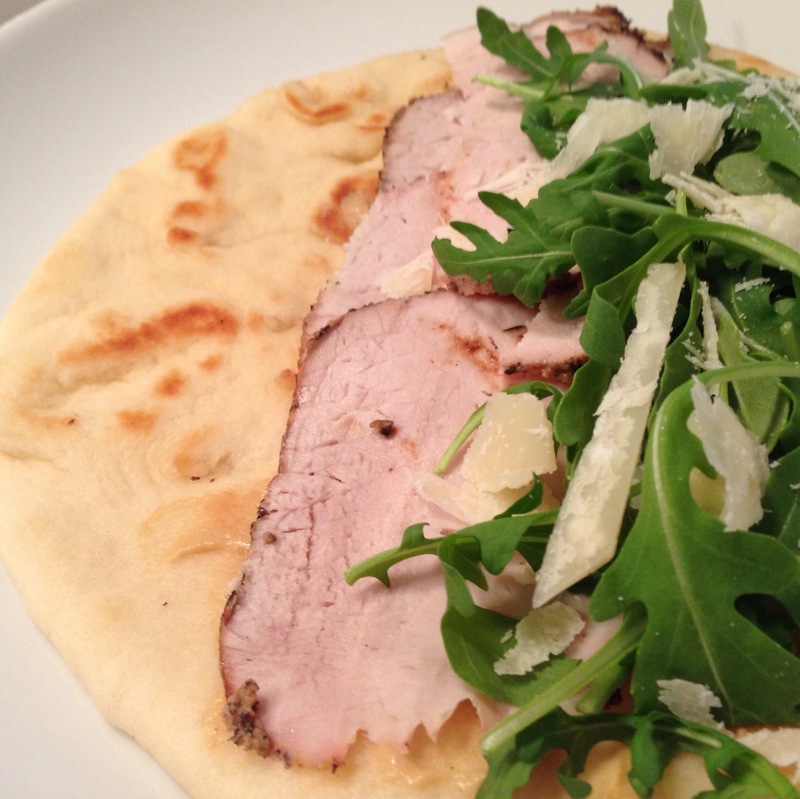 Layer on arugula, parmesan shavings, and very thinly sliced pork. Wrap, and enjoy! I’m really not kidding you – the smell of this pork cooking is one of the best things you’ll ever experience in your life. And not only does it smell like heaven, but it imparts a TON of flavor into the pork (which I suppose is kind of the point). 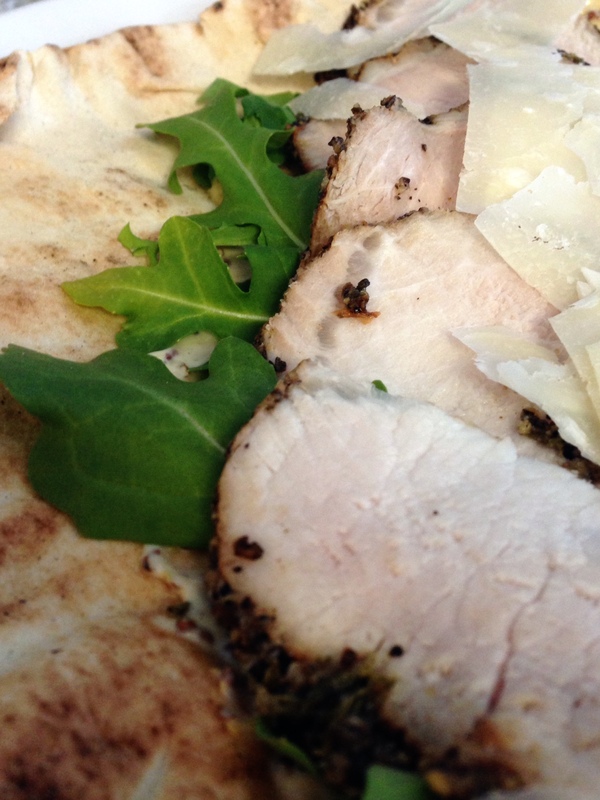 The pepper-y, garlick-y crust has a great hit of spice – next time, I think I’d try this pork on a salad filled with parmesan, some pine nuts, and a lemon vinaigrette. 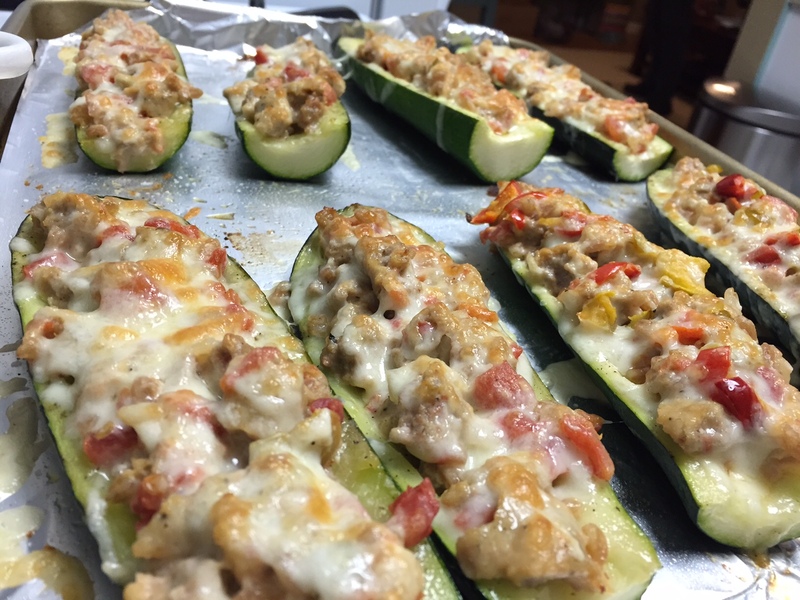 You could also make this pork into a great little appetizer! 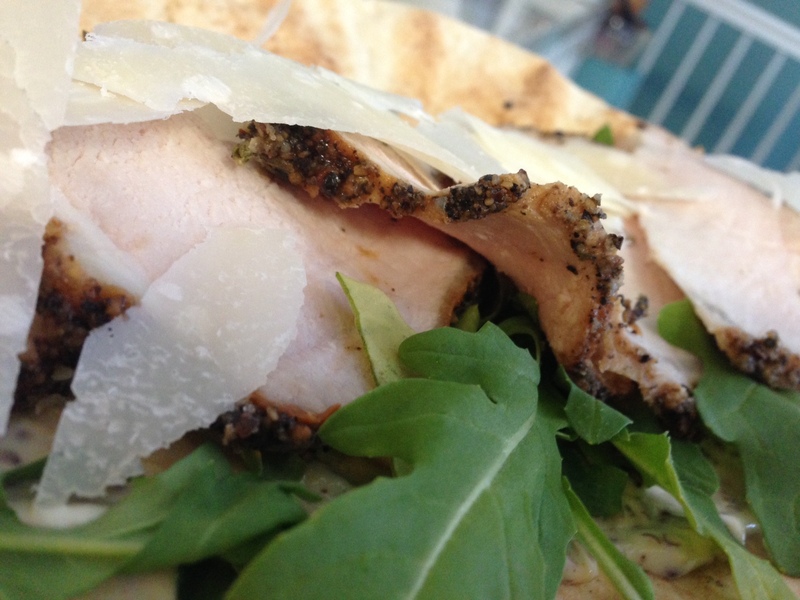 Cut some grilled pitas into wedges, spread with the lemon mayo, add a couple leaves of arugula, a piece of pork, and some parmesan – then spear the whole thing with a toothpick. Best of all, it can be served at room temperature, so it can be made and assembled ahead of time. So, you whipped up a batch of kale pesto last week, and you had a bit leftover… not quite enough to freeze for another batch of pasta, but enough that it seems silly to throw away. A few tablespoons worth, maybe. I found myself in this exact situation this past week – or, almost this exact situation. Turns out, the monster bunch of kale I used to make my pesto actually produced enough pesto for TWO one-pound batches of pasta… and then some. I mixed some of the pesto with linguine for dinner (and several leftover lunches for my husband), froze another portion to have on hand for an easy dinner later, and still had about a quarter cup left. I threw it in the fridge, knowing I’d come up with a way to use it later. Well, later came – and it was yet another exceptionally frigid day, with a threat of snow. By the time I got home from work, I was exhausted and freezing, and wanted nothing more than to put on my warmest sweats, and make dinner in less than 15 minutes. Enter: leftover kale pesto! 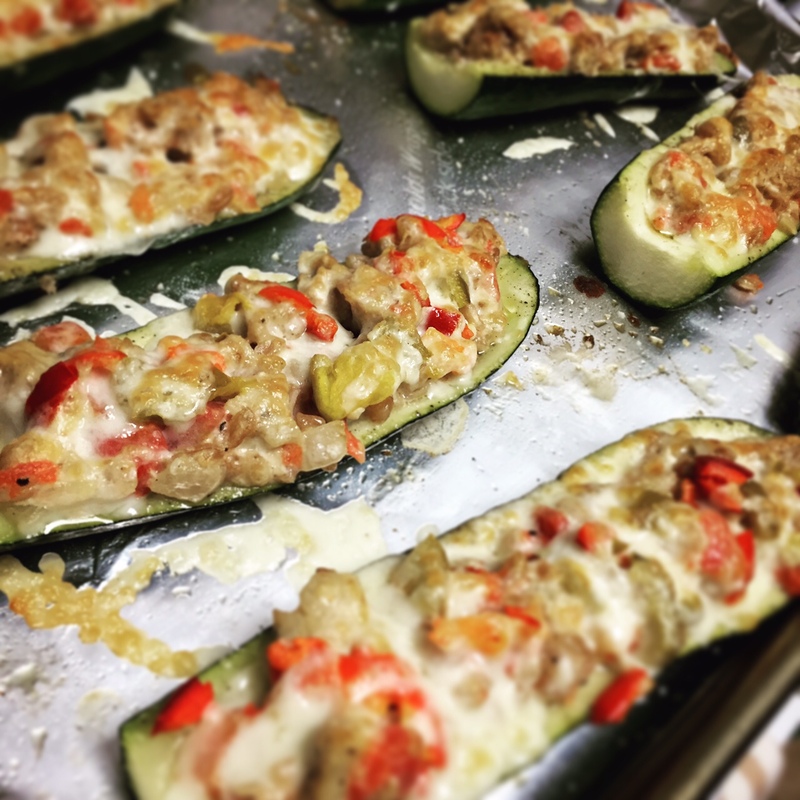 A quick scan of the fridge produced two great ways to use up the leftovers. First, grilled cheese sandwiches, fancied up with some kale pesto, and crisped prosciutto. Second? A delicious dip for raw vegetables that took approximately 8 seconds to make. And BAM, dinner was done! 1.) Start by crisping up your prosciutto. Heat a small skillet over medium heat, and throw in the prosciutto slices; it should take just a minute or two on each side for the prosciutto to render some fat, crisp up, and turn golden brown. Remove the prosciutto to a paper towel-lined plate to drain. 2.) 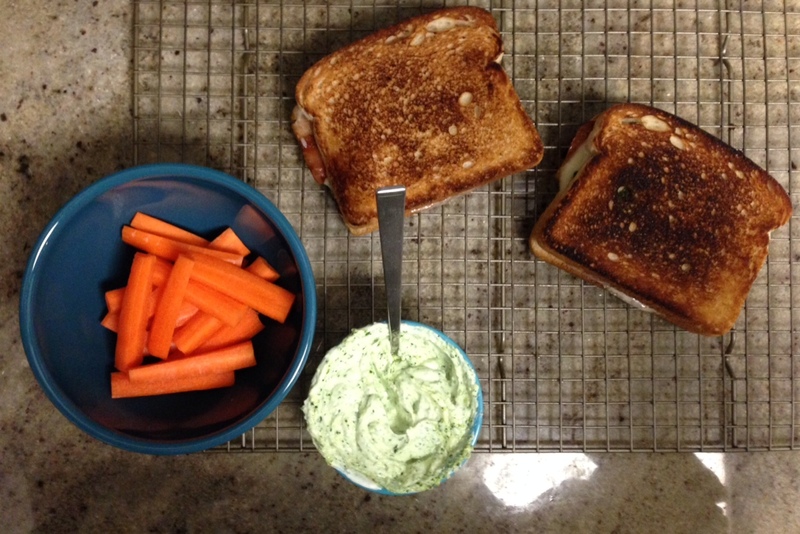 On two of the slices of bread, spread a tablespoon of the kale pesto. 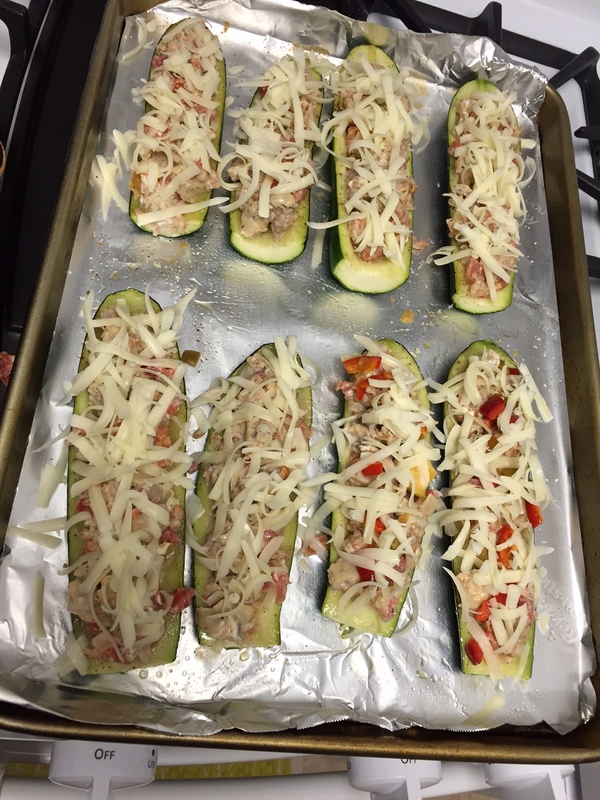 Top with the provolone cheese, then the prosciutto, then the asiago or parmesan. Top each sandwich with the remaining slices of bread. 3.) Heat a skillet over medium low heat, and melt about half a teaspoon of butter in the center of the pan. Most people spread softened butter directly on to the bread for their grilled cheese; personally, I find that, while it results in a crispy, buttery, brown crust on the sandwich, it’s a little TOO buttery and greasy for my liking (and I LOVE me some butter, trust me). By melting the butter directly into the skillet, you’re able to use a lot less, and still get the desired brown, crispy crust. ANYWAYS (my apologies for my lecture on Grilled Cheese Etiquette), melt the bit of butter in the center of the pan, and then add your sandwich to the pan. 4.) Cook each sandwich for about 2-3 minutes per side, until the bread is golden brown, and the cheese is fully melted (I often loosely tent the pan with foil, to help speed up the cheese melting process). 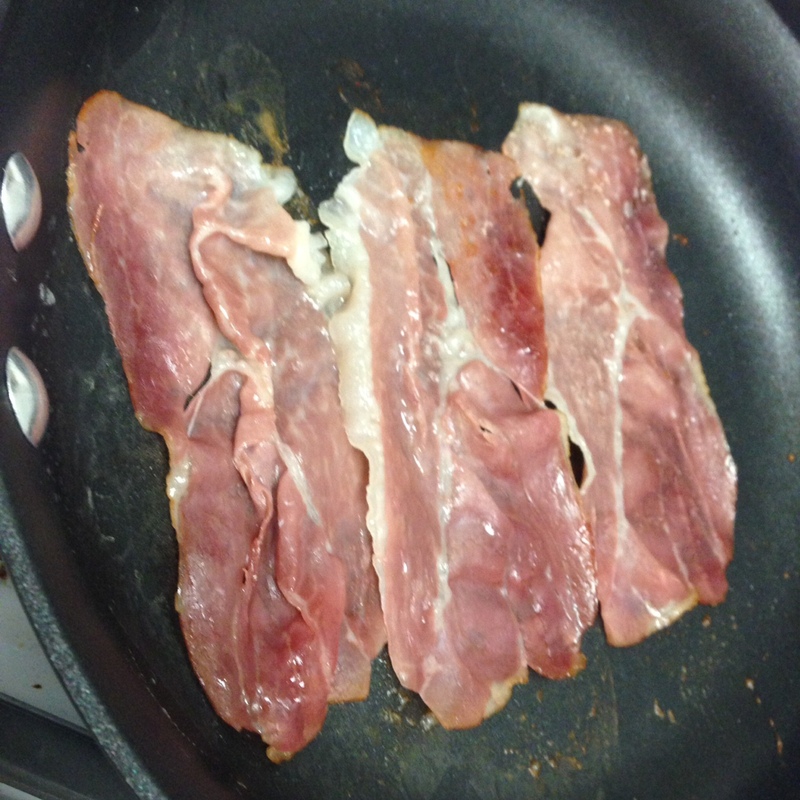 Add a bit more butter to the pan when you flip the sandwich, so the second side will brown nicely as well. 5.) Allow the sandwiches to rest for a couple minutes after removing them from the pan, so the cheese can firm up slightly, then cut in half and serve. Of course, this “recipe” is about as flexible as they come. If you don’t have prosciutto? Use bacon! If you don’t want to use meat? Don’t! 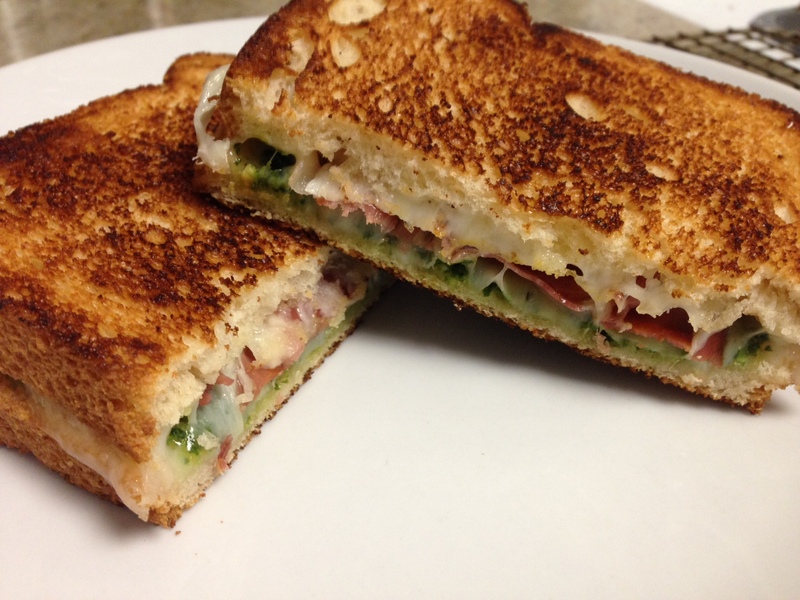 If you think tomatoes would really make this grilled cheese amazing? Put some in! Got some leftover caramelized onions looking for a home? Add ’em to your sandwich! The point of all of these very, very many words: even if you HATE leftovers (*Tina quietly raises her hand*), you can often make them into something totally different than their original state. Leftover meatballs can become meatball pizza! Extra ham from Easter turns into a delicious dip! 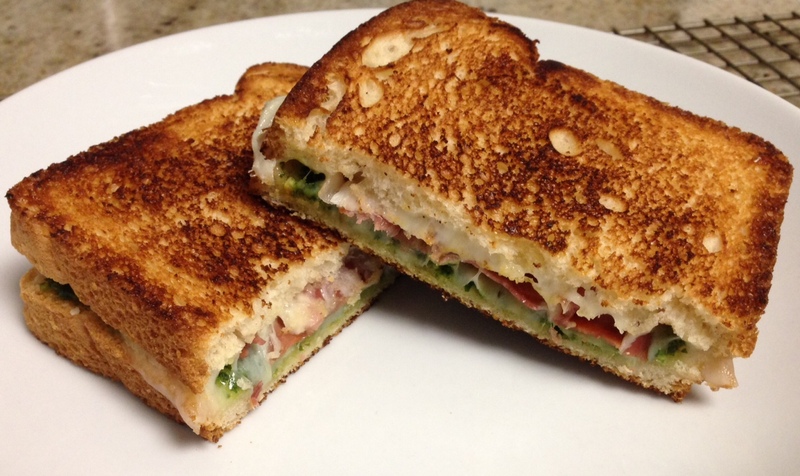 A pesto that began its life as a pasta sauce is now a sandwich spread! Asparagus is one of those vegetables I’ve just never really loved. It’s okay, and I’ll eat it – and depending on the preparation, sometimes I’ll even LIKE it. But, I just can’t get excited about asparagus! 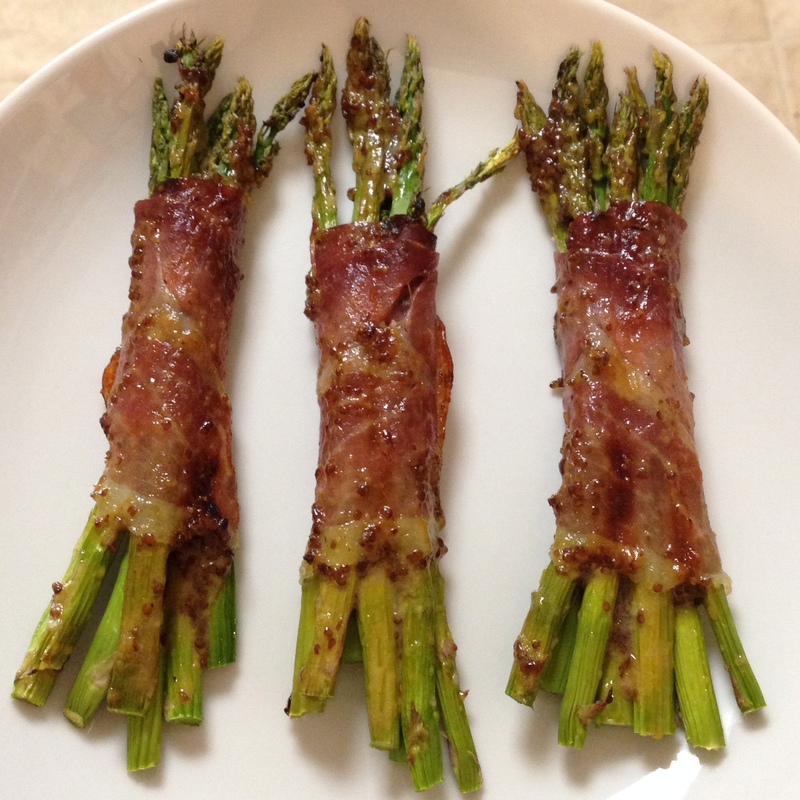 I buy it occasionally (typically when I come across a nice-looking bunch of very thin stalks), and I usually roast it with some olive oil, balsamic vinegar, and kosher salt… but, the last time I brought some asparagus home, I decided to dress it up a little. 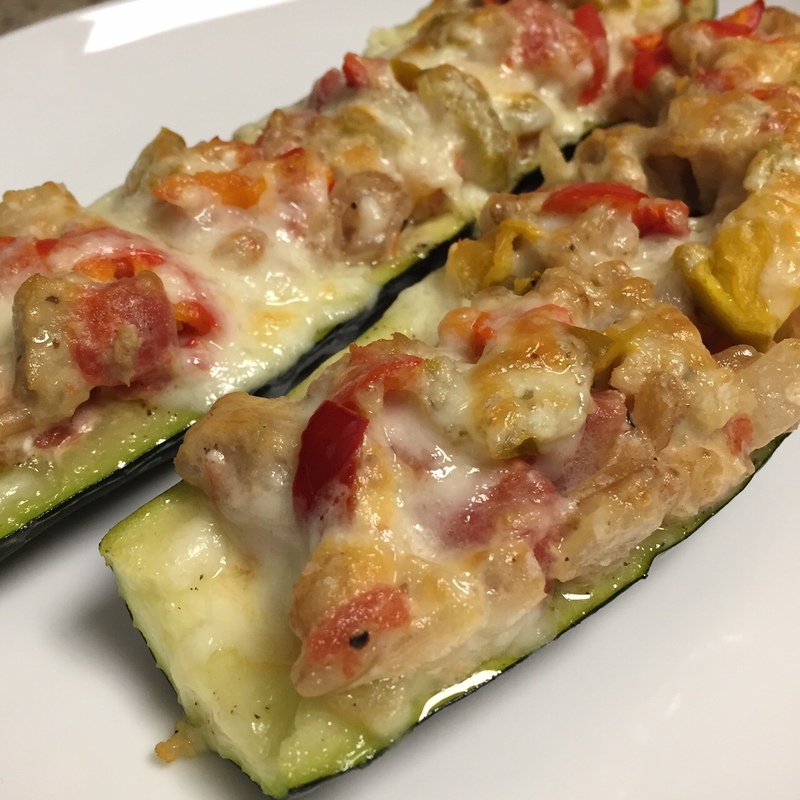 As I tend to do, I surveyed the contents of the fridge, brainstormed a little, and came up with a new recipe to try. 1.) Preheat your oven to 400°. Line a rimmed baking sheet with foil, and place a baking rack inside the sheet. 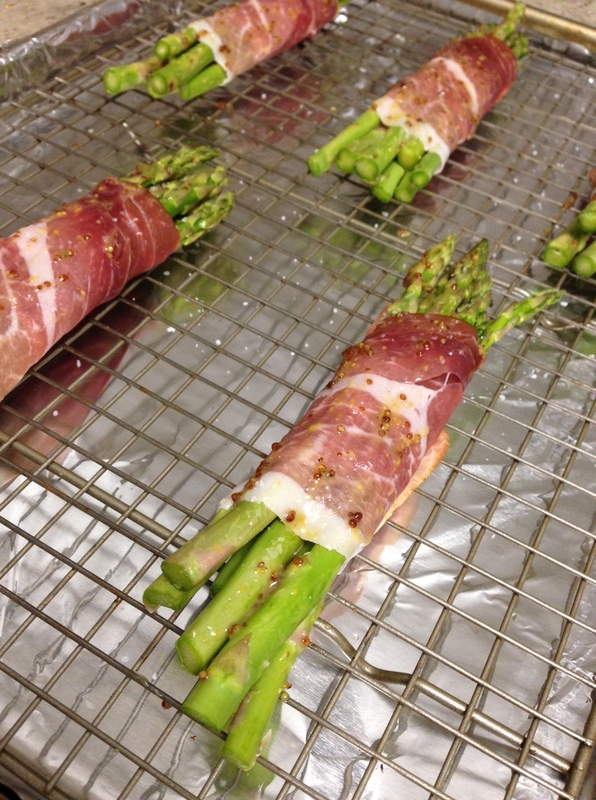 Divide the asparagus into 6 even piles, and wrap each one with a slice of prosciutto; lay the bundles seam side down on the baking rack. 2.) 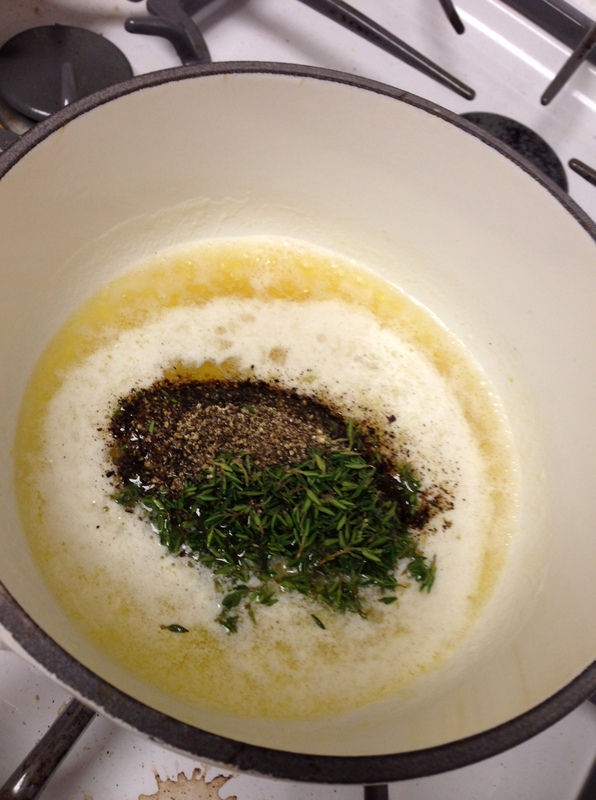 In a small bowl, whisk together the whole grain mustard, honey, and olive oil. 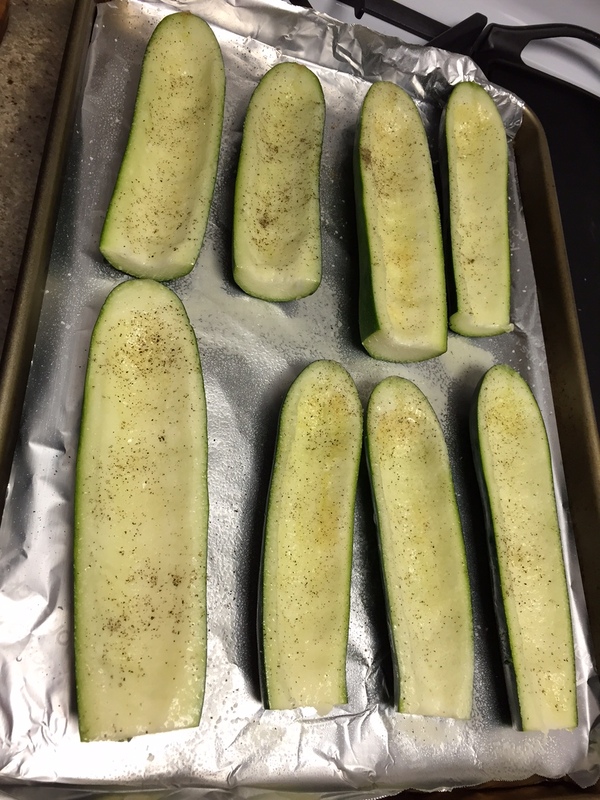 Lightly brush a thin layer of glaze over each bundle, then sprinkle them lightly with kosher salt. 3.) Place the asparagus in the oven; after about 10-12 minutes, take the bundles out and brush them with the remaining glaze. 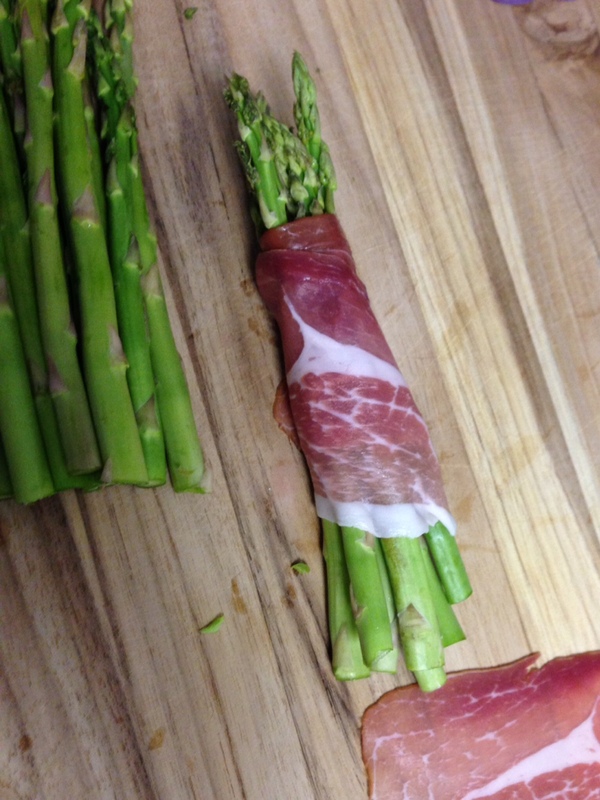 Roast for another 10-12 minutes, until the prosciutto is crisp, and the asparagus is lightly browned. I finished mine with about 90 seconds under the broiler, to get a little extra crunchy, delicious, golden brown-ness going on. Serve immediately. If you have trouble getting your children (or yourself?) to eat green vegetables? Make these. Right away. As I mentioned before, I am not the world’s biggest fan of asparagus – and I am not kidding you, my husband and I ALMOST got into a fist fight over the last asparagus bundle. (We ended up splitting it, like civilized adults, but he gave me the half with the crispy tops, because he’s smart and he knows better than to make the cook angry.) 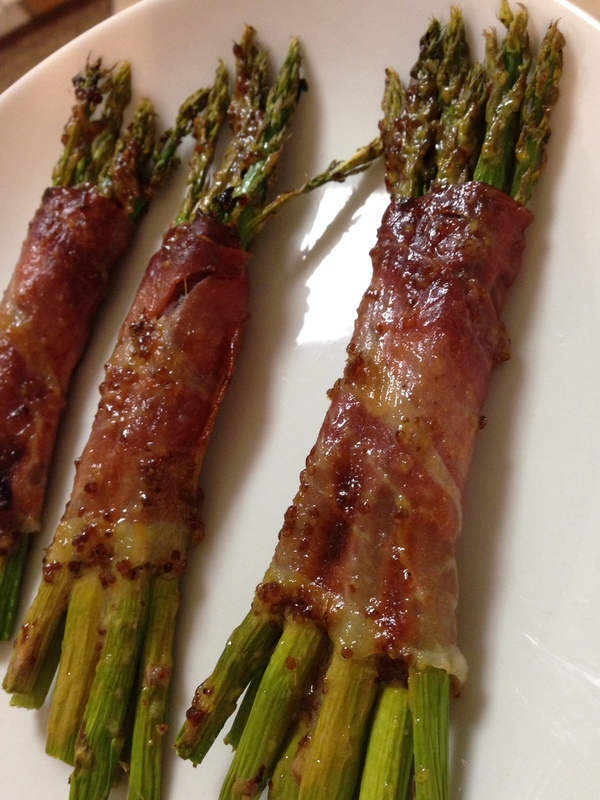 The sweet/salty combination of the prosciutto and honey is spot on, and the mustard gives a little tang, and has an earthiness that pairs really well with the asparagus. These little bundles would be great for a dinner party – they’re fancy looking, delicious, and they take about 14 seconds to put together. Everyone wins!